There are several procedures available to register pharmaceutical drugs in the EU. The method chosen depends on the type of drug (Over the Counter - OTC, prescription drugs - Rx, Generics, new chemical entities, products derived from biotechnology to name a few) and the intended route to market. European legislation foresees certain procedures for specific product types e.g the centralised procedure is mandated for products derived from biotechnology, orphan drugs and drugs designed for certain disease groups such as AIDs, cancer, neurodegenerative disorders and diabetics. Other products can be registered via the national route or using one of the European procedures namely the Mutual Recognition Procedure (MRP) or the Decentralised Procedure (DCP). If an applicant wishes to obtain a license in one Member State (MS) an application must be made to the national Competent Authority (CA) which then issues a national license. Since 1 January 1998 national licenses are strictly limited to the initial phase of Mutual Recognition. For products to be registered in more that one Member State (MS) and which do not qualify for the Centralised Procedure (CP) applicants must use either the Decentralised Procedure (DP) or the Mutual Recognition Procedure (MRP). The MRP is to be used if the aim is to register in more than one Member State and the medicinal product in question has already received a Marketing Authorisation (MA) in any MS at the time of application. The MRP is based on the idea that a national license approved in one EU Member State (Reference Member State – RMS) should be mutually recognised in other EU countries (Concerned Member States – CMS). This is based on the assumption that the evaluation criteria in the EU member states are sufficiently harmonised and are of the same standard. At the end of a MRP national licenses are issued in the CMSs involved in the procedure. Harmonisation throughout the life cycle of the product is ensured by the application of variations (detailed in Regulation (EC) No 1084/2003) simultaneously in the RMS and the CMSs. To this end the Marketing Authorisation Holder (MAH) must ensure that they have the resources to achieve this concurrent submissions in all countries involved in the MRP. The Decentralised Procedure (DCP), in general, follows the same principles of the MRP. A licence approved in one Member States (MS) should be mutually recognised in other Member States (MSs) assuming that the evaluation criteria in the EU member states are sufficiently harmonised and are of the same standard. 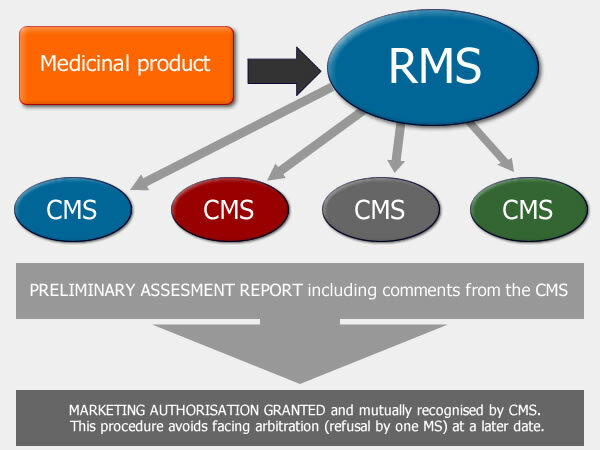 The DCP is to be used if the aim is to obtain marketing authorisation in several Member States (MSs) where, at the time of application, the medicinal product in question has not yet received a Marketing Authorisation in any MS. The main difference between the MRP and DCP lies in the fact that the Concerned Member States (CMSs) in a DCP are involved at the onset of the procedure as opposed to waiting for approval before an application is made in the CMS. This is shown below. In order to obtain a Community Authorization, an application is made to the EMEA – The European Medicines Agency. The application is scientifically evaluated by the Committee for Medicinal Products for Human Use (CHMP) or the Committee for Medicinal Products for Veterinary Use (CVMP). The European Commission receives an opinion within 210 days and drafts a decision on a Community MA. A MA granted under the CP is valid for the entire EU market. Document: Notice to Applicant, Vol 2A, Chapter 1 "Marketing Authorisation", 2005.